Joe Winkfein took home one of the first Bolts delivered to Canadian dealerships. The battery-electric car has a claimed maximum range of 383 kilometres. 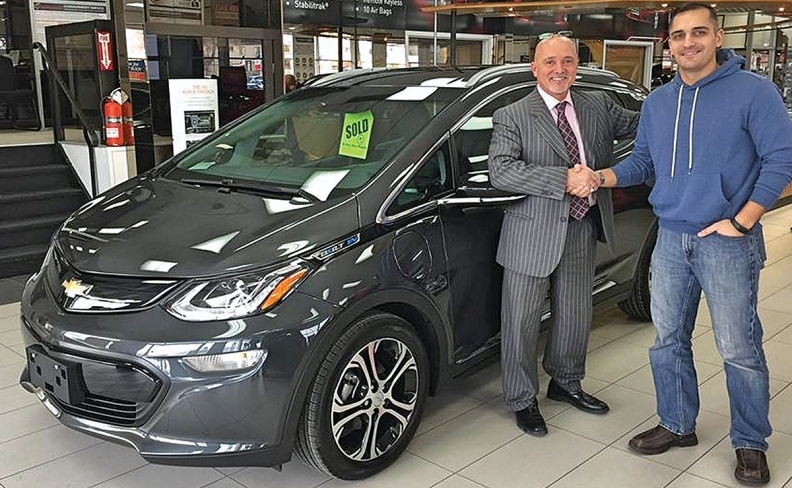 Joe Winkfein is technically Canada’s first Chevrolet Bolt owner, even though Claude Michaud of Sainte-Marcelline, Que., could probably lay claim to the same. The much-anticipated battery-electric vehicles began rolling into Canada on Jan. 26. Winkfein signed for his Friday, Jan. 27, but didn’t take immediate possession of the car. Instead, he allowed Dean Myers Chevrolet Buick GMC Corvette to keep it over a weekend to show prospective customers. He drove it home Jan. 30, at about the same time Michaud was doing the same at Bourgeois Chevrolet Buick GMC, in Rawdon, Que. Both dealerships celebrated the sales on their Facebook pages. Bourgeois posted 36 photos and two videos of the event, from the car’s arrival on an auto hauler on Jan. 26 to Michaud accepting the keys on Jan. 30. “When I saw the Bolt unveiling last year, I realized this was the car for me and put a deposit down,” Winkfein told Eric Carriere of the blog Time to Electrify. Meanwhile, Michaud told the French news website l’Action that he was simply tired of spending $50 to $60 to fill up his car. So, he owned a Volt first and replaced it with a Bolt. “I've been thinking electrically for a long time,” he told l’Action. General Motors launched the Bolt in three provinces in January. GM Canada will focus on British Columbia, Ontario and Quebec, the only provinces that offer government rebates —and significant ones at that — during its initial rollout. And in those provinces, only dealerships that are set up to sell GM’s range-extended Chevrolet Volt will be eligble to also sell the Bolt.